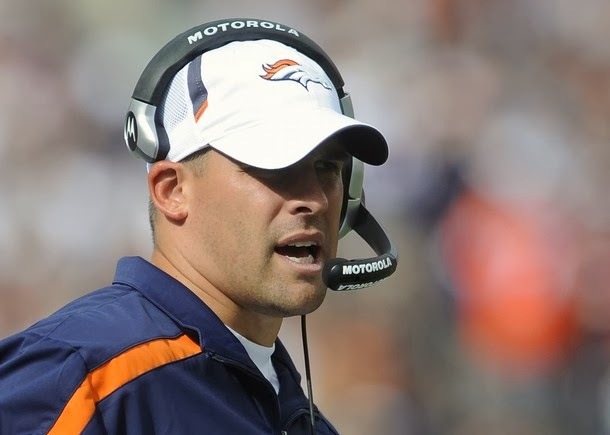 When you think of Josh McDaniels and Denver, what is the first thing you think of? That's what McDaniels was ultimately known for, drafting Tebow in the first round of the NFL draft. It's probably not what ultimately doomed his tenure as head coach in Denver, but it certainly didn't help. Still, McDaniels may have made some big mistakes, but there's plenty that he did during his time in Denver that has them in the position they are in now. "He did draft me, and I’m very thankful that he gave me the opportunity to be playing in the NFL, especially with such a great organization like Denver," said one of Denver's many weapons, receiver Eric Decker. "I’ve got a lot of respect for him as a coach. He’s a brilliant mind, offensively. I’m sure, like any coach, he’s excited and he’s happy for the guys that he drafted." After being fired in Denver, McDaniels moved on to become offensive coordinator for St. Louis, and then moved back to that same role with New England, which he still holds. I'm not sure exactly how happy he is to see Denver in the Super Bowl over his Patriots, but he certainly has to feel good that the players he brought into that organization are some of the cornerstones of their success. Decker is not the only piece brought in by McDaniels that has the Broncos where they are now. Knowshon Moreno, Demayrius Thomas, Zane Beadles, Robert Ayers and David Bruton are all still remaining as players McDaniels brought to Denver and they have all been impressive one form or another. Notably, Thomas effectively ended the Patriots season when Aqib Talib went down in the AFC Championship game. As Manza Young points out, only 6 of the 19 players McDaniels brought in still remain from those '09 and '10 seasons, but each are a key piece to the Broncos' Super Bowl run. "For Coach McDaniels, giving me the opportunity to play in the league and try to fight for a position," said Moreno. "Even though you make it, even though you get drafted or whatever it is, maybe you’re not drafted, you’ve still got to compete. You’ve still got to get better each day just to have a spot on the team. I’m really thankful to [get] the opportunity." Of course, it's not only the players that McDaniels brought in that have helped this Broncos team, it's the coaches as well. Specifically, Broncos offensive coordinator Adam Gase, who has had plenty of praise heaped on him by Quarterback Peyton Manning. Adam Gase actually got his start on the Broncos coaching staff because of Josh McDaniels, who hired him as a wide receivers coach. "Lucky enough to meet Josh McDaniels when I was 21 years old, and he became a head coach nine years later," Gase said. So, hey, there are some loose Patriot ties in this Super Bowl game beyond just Wes Welker. It does show that McDaniels at least had some eye for talent, and as the coach rumored to be the heir-apparent to Bill Belichick, that's encouraging for Patriots fans. At the very least, it shows he clearly has a good track record and evaluating wide receivers in the draft, one can only hope he's had some input in the Patriots draft this past year when they selected Aaron Dobson, Josh Boyce and signed Kenbrell Thompkins as an undrafted free-agent.